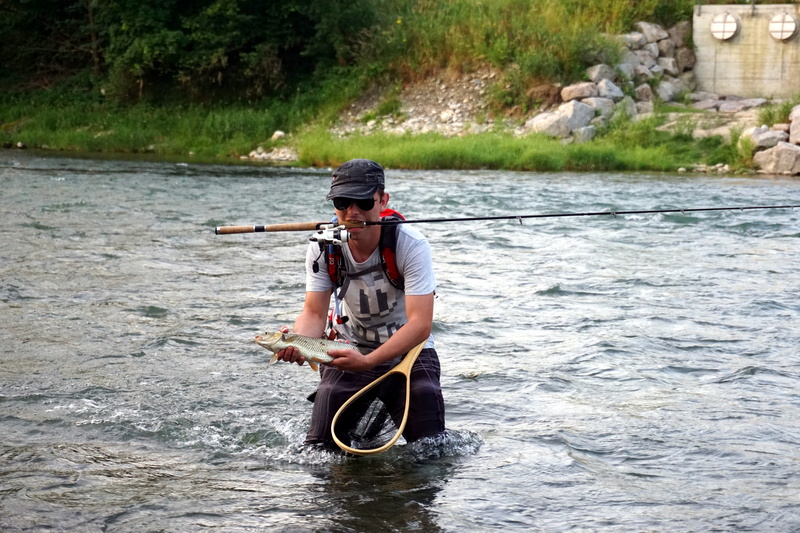 Fly Fishing alte Aare Switzerland from ExpediTom on Vimeo. Once my neighbour and I had the spontaneous idea to go fishing on an early Sunday morning in the alte Aare in Dulliken. It was the first time I went there with my fly rod. Before I had been there with spinning equipment a few times. Although I wasn’t very successful on the trips before, I was looking forward because it’s a beautiful place with a lot of interesting things such as many animals. Additionally, as it is a quiet natural finish zone, it is a good place to dangle your soul. I have enjoyed very relaxing evenings and unforgettable nights out there. Unfortunately, sometimes you’ll find plenty of people there, especially at weekends. But if you don’t mind to take a short walk, you will always find a hidden spot for you. Unfortunately, some people don’t care that much about nature and their environment as I do and leave their rubbish behind. This makes me go crazy! In my opinion there’s no reason to leave anything behind what you carried in. But that’s another story. We arrived there shortly after sunrise and got ready within minutes. We both didn’t want to lose any minute in the water. And I mean in the water, because we decided to try wet wading. This means, instead of wearing waders we used long underpants (against insect bites) and swimming shorts. Wet wading is common in New Zealand, because there you often have to walk to your preferred fishing spot. The advantage of this type of fishing is your flexibility and you don’t overheat during summer. As we walked through the forest to the river we noticed many mosquitoes. However, as soon as we reached the bank of the river they disappeared. Mike was fishing with spinnerbait and I was fly fishing with the Scott A4 rod 9” #6 with a Sage (3200) reel. Given that I had never fished in this river with a fly before, I used a fly with a common pattern, which didn’t imitate something specific. As an example a bivisible is one of that kind of fly. I had just finished tying the fly to my leader when Mike suddenly shouted: “Got one!” After a short fight in the strong current he landed this fat chub. We both didn‘t expect to catch a fish that soon. Unfortunately, it should be the only catch for more than 3 hours. During this time I had tried about 15 flies and 5 nymphs. However, instead of worrying about the unsuccessful time period we enjoyed the beautiful surounding. We saw a beaver swimming up the river, as well as different kinds of birds. And the best thing was, we were the only ones out there. After about 2 km we arrived at a spot where a big tree had fallen into the river and made further wading impossible. Thus, we had to leave the river and walk through the forest. However, a few seconds later we run back into the water since there were hundreds of mosquitoes in the woods. I guess it was lunch time. ;-) But there was still that tree blocking the way. I tried to wade around the tree but soon realised that there would be no other way but swimming! This was the first moment I regretted not having bought a truly waterproof waist pack (I use a Field and Fish waist pack). This would have made it easier with my electronic devices. But we found a solution. We deposited our belongings and the rods on the tree, swam around it and then grabbed our stuff from the other side. I guess it must have looked funny to other people. However, for me it was a good experience because since then I know, that in case I ever fall into a river, I could easily swim with my wading boots on (I use Patagonia Ultralight wading boots). After this obstacle we continued fishing until midday without anything special happening. We nearly gave up but Mike wanted to fish some 100 meters further down the river. My stomach rebelled but my will to fish was still stronger. After a short while, I definitely didn’t regret this decision. In a small pool with strong current I caught this beautiful grayling on a dark nymph. My first thought was that my fly was caught in an underwater tree, which was teetering. The more I was surprised when I recognised a dorsal fin that stood out of the water. It was a short drill after which I released the fish, because it was too small. Mike told me that those fishes live in groups and gave me the advice to give it another try in the same spot. We saw how a dark shadow rose from the bottom of the river and swam straight up to the fly. A few centimetre in front of the fly he turned away and my disappointment was big. 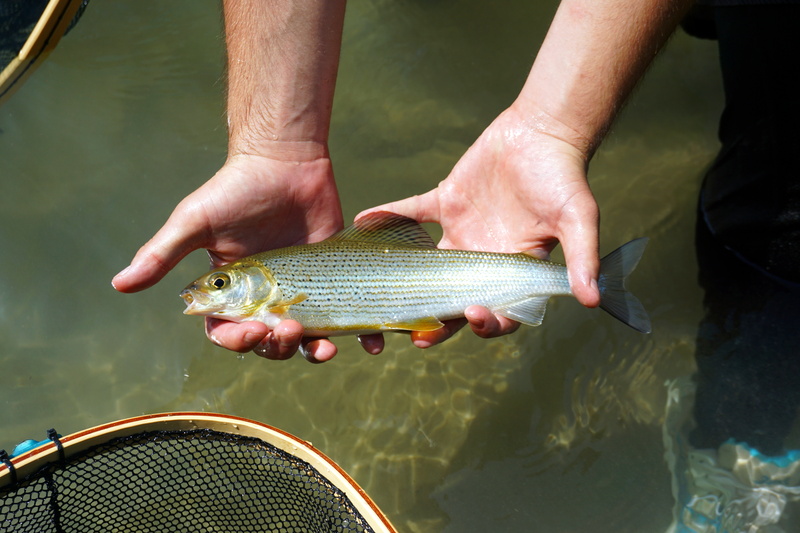 I tried again and TOCK – the next grayling took the nymph, but it was nearly the same size as the first one and I had to release him. 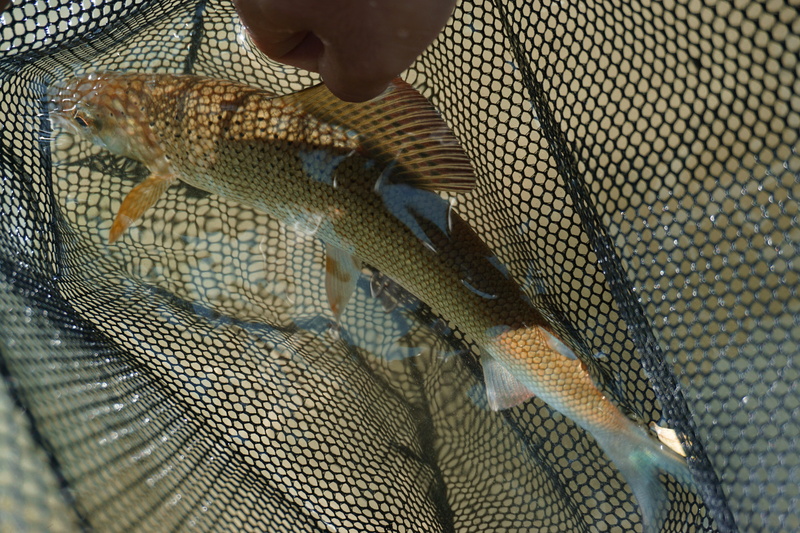 We fished the last dozen meters of another pool and the third grayling bit on a dropper nymph. You can’t imagine how my heart was pounding with happiness after these 30 minutes. And my stomach – well I think he was happy as well because he wasn’t complaining anymore.